•Chandrashekhar Tiwari was born on 23 July 1906 at Bhabhra, Madhya Pradesh,. •Pandit Sita Ram Tiwari and Jagrani Devi are his Parents. 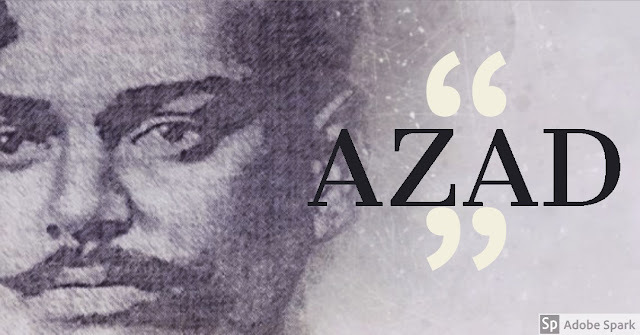 •He was Popularly known as Azad. •was a Revolutionary leader, freedom fighter and a political activist. •He had a great amount of contribution for the Indian Freedom Struggle. •At an early age of 15, he joined the Noncooperation movement in 1921. •He was arrested while demonstration of NCM and when asked of his details by the British police he told, that his name was ‘Azad’, his father’s name ‘Swatantrata’ and his residence as the prison cell. • Chandra Shekhar grew up with Bhils who inhabited the area and learned wrestling, swimming along with archery. आजाद हैं और आजाद ही रहेंगें. " •Embraced martyrdom and pumped Nationalism in the hearts of his contemporaries. •By 1922 he became an Active member of HRA (later renamed to HSRA) used to collect funds for the organization, by his daring acts of loot of British Government. •British police had a bounty of Rs. 30,000 on his head. •On February 27, 1931 Chandrashekhar Azad was meeting with friends at Alfred Park, Allahabad. •Police had information of this act, and surrounded the park before hand. •Azad fought and gave backup to his friends for safe exit also killed three policemen. • After a long session of his fight and not able to find and escape, he shot himself in the head with his last bullet. •He Kept his words of being Azad and never to be captured by the British.